Vladimir Shafranov, a multinational jazz pianist based in the Åland Islands, brought Lena Bloch on saxophone and Putter Smith on bass to the intimate salon-like atmosphere of the Salmagundi Club last week. Vladimir Shafranov was educated in Leningrad Conservatory on violin and piano. Already as a teenager he began playing jazz at the local scene, much to dismay of his teachers. He emigrated to Israel in 1973 and then to Finland in 1974. While in Finland he was one of the most in demand pianist especially accompanying visiting Americans. Greatly encouraged by many of them to move to New York he did so in 1983 and was very active in Manhattan Jazz Scene playing at clubs such as Bradley’s, Blue Note, Village Vanguard, Village Gate among others. He was a duo partner with bassists like Ron Carter, Red Mitchell, George Mraz, and Buster Williams, led trios with Ron Carter-Al Foster, Rufus Reid, Victor Lewis, George Mraz, and Albert “Tootie” Heath to name but a few. He also played with many top soloists such as Freddie Hubbard, Dizzy Gillespie, Art Farmer, Clifford Jordan, George Coleman, Pepper Adams and accompanied singers such as Carmen McRae, Ernestine Anderson, Etta Jones, and Jimmy Scott. Since 1998 he and his family settled on Åland Islands and has become one of best-selling jazz pianists in Japan having released 11 CD’s and a DVD. His latest release is “I’ll Close My Eyes” (2010) featuring Jesper Lundgaard on bass. These seasoned musicians drew a respectable audience who listened attentively and took it all in with pleasure. Several of our performers have noted that our audiences tend to be serious listeners – no talking and clinking of glasses in the background! We hope to hear them again soon. A pleasant surprise was Shafranov inviting his friend, jazz singer Jeannine Otis, from the audience to participate in two songs towards the end of the program! Emma Larsson and Sami Linna drew a sold-out crowd at the Salmagundi Club for their performance of Emma’s own songs, smooth jazz classics and some bossa nova. Emma commented afterwards “the audience was so respectful – they actually listened!” – which was, of course, because this was a stellar performance with lots of little nuances that were heard easily in the cozy atmosphere – the bar at the venerable old artist club in Greenwich Village. Nobody wanted to leave… Please come back again, Emma and Sami! FCF and Arctic Circle Finns of New York (a meet-up group) organized a private event for members at the Nygard fashion store on Broadway and 40th St on December 8. Guests were treated to wine and hors d'oeuvres and some were invited to participate in a short modeling session. Liisa Nygard Johnson, the sister of Peter Nygard — a Canadian Finn who created the successful fashion empire — read excerpts from a recently published biography of their mother, Hilkka. Sini Simonen gave a perfect performance on November 4 at the Salmagundi Club! Simonen has already been awarded in several valued violin contests: Finalist, Sibelius Violin Contest 2005; 2nd prize, Carl Flesch -Violin Contest 2008; 1st prize, Cremona International Violin Solo Competition 2008; and 2nd prize, Rodolfo Lipizer -Violin Contest 2009. Simonen has played recitals in Finland, Germany, Norway, Hungary, Italy, Switzerland and Holland. She has appeared as a soloist with orchestras such as the Finnish Radio Orchestra, the Helsinki Philharmonic, the Trondheim Symphony Orchestra, The Gyõr Philharmonic, the Kuopio Philharmonic and the Helsinki Strings. She has also toured as a chamber musician in Japan and Mongolia with the reowned violinist Midori. Her first commercial recording was published by Warner Music in 2010; she plays as a soloist of the Bach Double violin concerto with Réka Szilvay and the Helsinki Strings. Her teacher of many years is Lara Lev, who was in the audience at this performance also, and seemed happy with her student’s performance! Simonen is ready to compete in the upcoming Sibelius Violin Contest in Helsinki from November 21 to December 2, where she is one of two Finnish participants among 40 finalists. Her program at the club consisted of both solo pieces and compositions for violin and piano; she was accompanied by Oskar Jezior. She showed her mastery of both classical pieces such as a Solo violin sonata in C-major by J. S. Bach, Violin concerto No. 5, A-major by Mozart, Capriccios No. 11 and 24 by N. Paganini and Ballade Op. 115, Danse caractéristique Op. 79/3 and Danse champêtre Op. 106 /1 by Jean Sibelius; as well as modern compositions by Kaija Saariaho (Tocar) and Ysaye (Solo violin sonata, No. 6). We wish Sini success in the contest and hope to hear her again in New York, perhaps on a larger stage next time! Members of the book club got a special treat when the author of Poissa, Meritta Koivisto, paid a visit to their meeting. Some of them also attended her Creative Writing lecture held at Columbia University on October 13. FCF members who are conversant in Finnish enough to read contemporary literature, are welcome to join the book club to keep up their Finnish skills. Books are chosen by consensus, ordered, or bought in Finland and often shared between members of the group. Contact info@finlandcenter.org for details. On a night when most New Yorkers stayed indoors, some 50 Finns and other Scandinavians ventured out, undaunted, in the rain and sleet to the Norwegian Seamen’s Church. Esa Pietila’s 4 Streams Quartet offered some of the best high-class jazz we have heard in a long time, an event co-sponsored by Finland Center Foundation and the American Scandinavian Society. The quartet, consisting of Esa Pietilä on tenor saxophone, Iro Haarla on piano, Uffe Krokfors on bass and Markku Ounaskari on drums, trolled up original compositions which ranged from the delicate to the vibrant and kept their audience rapt. The intimate setting of the Norwegian Seamen’s Church, without the clatter of glasses usually heard in a bar, helped us really appreciate the music. Nordic Breads and Valio provided Finnish rye bread and cheese for the reception afterwards. The group continued to a jazz festival in Quebec, and we hope to have them back in New York soon. KAIVAMA is a talented new duo consisting of Sara Pajunen, violin, and Jonathan Rundman, guitar, piano, and harmonium... (Yes, check out that funny looking box in the photo! If you are old enough, you remember those things in the classroom of your elementary school in Finland, which the teacher would play to accompany the class in hymn-singing!). The duo, on an East Coast tour from their respective homes in Michigan and Minnesota, entertained a roomful of folk music fans in the parlor of the Salmagundi Club on Thursday, Sept. 9. Kaivama takes its name from the Finnish verb kaivaa ('to dig, excavate, explore') and that is what they do with their music – explore their roots – both members of the duo are 75% Finnish. Jonathan Rundman is actually a rock musician, and Sara Pajunen a classically trained violinist. The combination of the two has a vibrant result: they take old tunes and give them new interpretations as well as playing new pieces by current folk music composers, such as Arto Jarvela. They also presented some of their own compositions with strong folk music influence. Many feet were tapping in response to the catchy tunes and rhythms of polkka, polska, and schottis (jenkka) – we definitely want them back, and perhaps next time we will roll away the carpet and take a few steps! Check back soon for a link to a videoclip of the concert! Vilma Perkiomaki is a young but already accomplished violinist graduating soon from the prestigious Sibelius Academy in Helsinki. She was accompanied by Riko Higuma, a seasoned pianist with her own impressive resume, currently teaching at the Manhattan School of Music. The pair gave a nuanced performance of compositions by Bach, Brahms, Glazunov, and Sarasate at the Salmagundi Club to a very appreciative audience. As “the sugar on the bottom” we got to hear an encore, recognized by the Finns in the audience as Eero Järnefelt’s Kehtolaulu (Lullaby). PBS sponsored a free community screening of Steam of Life (Miesten vuoro), an acclaimed documentary about Finnish men in the sauna. The film had an appreciative audience at the Salmagundi Club, but for those of you who didn’t make it, it can still be viewed online HERE. Finnish jazz legend, pianist and composer Heikki Sarmanto, entertained us at the Salmagundi Club with new and old pieces, including wonderfully virtuosic improvisations of classical Finnish tunes by Kuula, Backman and Ehrstrom. A friend and collaborator in the audience, vocalist Jeannnine Otis, jumped in at the encore at the audience’s request — a special treat! 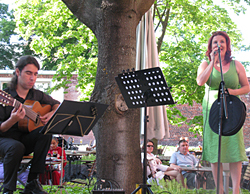 “Friends of New York” met new and old friends at the Jailyard terrace and listened to almost-New Yorker Heidi Lehmuskumpu sang lovely bossanova with Brazilian guitarist Fabio de Oliveira. The talented Anatoli Panchoshny has over twenty-five years experience as a concert soloist of Moscow Philharmonic covering numerous stages of Moscow and surroundings — from Baltics to Siberia. He currently teaches voice in New York City. His rich bass voice was magnificent to hear on Saturday, June 18 at the Salmagundi Club in New York. The program included many instantly recognizable songs and opera arias. Although he stumbled for a moment at the beginning of W.A.Mozart’s Aria Leporello from opera Don Giovanni, apparently not recalling the first words in Italian, he made up for it by repeating the piece in Russian! He seemed most at home, naturally, with the songs in his native language, P. Tchaikovsky’s "It was in early spring" and “At the ball”, and S. Rachmaninoff’s “Morning” and “Spring’s waters”, and the well-known traditional Russian song “Song of the Volga Boatmen”, which he performed as an added-on treat. Finland Center’s Music Director Kalle Toivio accompanied smoothly as usual. Acclaimed mystery writer, Leena Lehtolainen visited our Book Club on Monday, June 13. The club discussed her novel Väärän jäljillä. Afterwards a small dinner party was held at a nearby French bistro. Book club members discussed various topics, including one often featured in her novels: sexual violence against women and cultural differences in reactions to it. Last Saturday, Lauri Sallinen, accomplished clarinetist completing his year at the Manhattan School of Music, gave an excellent perfomance at a concert held at the Salmagundi Club. He was accompanied by Bradley Burgess, also from the MSM, on piano. The audience enjoyed the well-selected program, consisting of Carl Maria von Weber’s Gran Duo in three movements, Alban Berg’s 4 stucke – very modern sounding, eerily haunting tunes; and Johannes Brahms’ Sonata No. 1 for clarinet and piano, played with nuanced emotion and impeccable precision. A lovely, refreshing stop on a beautiful spring afternoon in the city! Mariko, an established Finnish singer with a career of 11 years, visited the Salmagundi club on Wednesday night and proved to be a versatile artist. Over 40 fans turned out to enjoy the evening, which consisted of blues/jazz standards, performed with excellent accompaniment by the Bumblebees. Mariko has been the lead singer of a hip hop/pop band Kwan since 2000. The band has released 4 albums with sales up to double platinum in Finland. In 2007 she took part and won Dancing With The Stars Finland. In 2008 she released her first solo album, Fabulous Tonight, a 80’s disco influenced popfest. Alongside of music she has been performing in musicals such as Spring Awakening and West Side Story. Lately she has been in and out of New York working on new songs and falling in love with the City. The Madetoja Music High Shool Girls Choir gave an excellent performance at the Finn Church. The girls moved the audience with a great choice of songs and the program ending with the Finlandia hymn. The choir is now off to Chicago where they will give an another performance before heading back to Finland. Also our new wonderful promotional video was premiered and is now viewable in FC’s Youtube channel. At the reception afterwards, Permanent Representative of Finland to the UN, Ambassador Jarmo Viinanen gave us an interesting view of “Reflections on World Affairs”. The reception was followed by a violin concert with talented young violinist Kukkamari Grondahl and pianist Tatiana Goncharova. The last show of Female Artist Club series represented fabulous Heidi Lehmuskumpu & Michael K. Howell. Salmagundi’s bar was packed as Friends of Finland came to see Heidi’s performance. The night was a big success ending with cheering applause. After six amazing performances of voice talent, we got a great view of Finnish female performers in different genres. Finland Center wants to thank everyone who took part in celebrating our talented female vocalists in NYC and supported our fast growing community. See you soon again! It was a great pleasure to enjoy Johanna Telander performing at Finland Center on 3/9, check out the pics from Finland Center’s Facebook page. Lovely Sara Nurmi performed at Finland Center on March 3, 2011.